At Instant Imprints Downtown Winnipeg, our customers come to us when they want to be more visible to their customers. We create that visibility five different ways: Branded Apparel (embroidery), Signs & Banners, Promotional Products, Custom T-Shirts and Print Services. Instant Imprints have provided all of our signage and printing needs for the 2018 Winnipeg Renovation Show and 2018 Winnipeg Home + Garden Show and strive to provide the best customer experience possible. Andre, Kalvin and the team at Instant Imprints have been a pleasure to work with and we look forward to working with them again on the 2019 shows. Are you looking to promote your business or your next event with custom t-shirts, printing services, promotional products, custom banners or branded embroidery items? Then look no further than Instant Imprints in Winnipeg! We have the latest in production technology to make sure you have the best promotional goods around. Our Winnipeg Image Experts are happy to provide you with a superior level of service while they work to get your job done right. Instant Imprints, at the Convention Centre in Winnipeg, is your go-to source for promotional products of all kinds! No matter what your promotional goals are, Instant Imprints in Winnipeg can help you make them happen. We pride ourselves in getting your job done right the first time, and we make a point to deliver it to you on time or early. Working with a professional print shop such as ours helps you to avoid the costly revisions that mire home or office printing attempts, and with a level of quality that can’t be beat. Let Instant Imprints in Winnipeg be your promotional partner on the path to greater brand visibility! Custom t-shirts are world renowned for their ability to turn a logo into a fashion item. Your custom tees serve as walking billboards, wherever they’re found, across Canada and beyond. Whether you’re looking to promote locally or globally, custom tees can give you a serious leg-up when it comes to brand visibility. Moreover, our custom embroidery service lets you personalize your professional attire or add flair to virtually any type of garment. 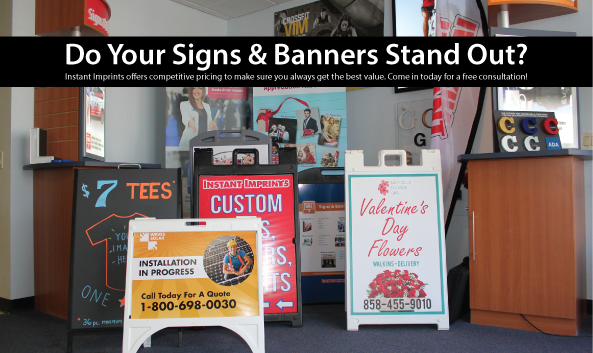 All around Winnipeg, businesses know the power of custom signs and banners. When you want to reach out to the masses in the most effective way, nothing beats a perfectly crafted custom sign. From sidewalk signs to large-scale banners, we can create the perfect calling card for whoever your target audience is. Our roll-up banners are durable and portable ways to bring your brand image to wherever it’s most effective. Impress your colleagues at your next conference with a professional trade show display from Instant Imprints in downtown Winnipeg! When you’re ready to step up your promotional game, stop in at our Convention Centre location, give us a call at (204) 219-8999 or request a quote online today!